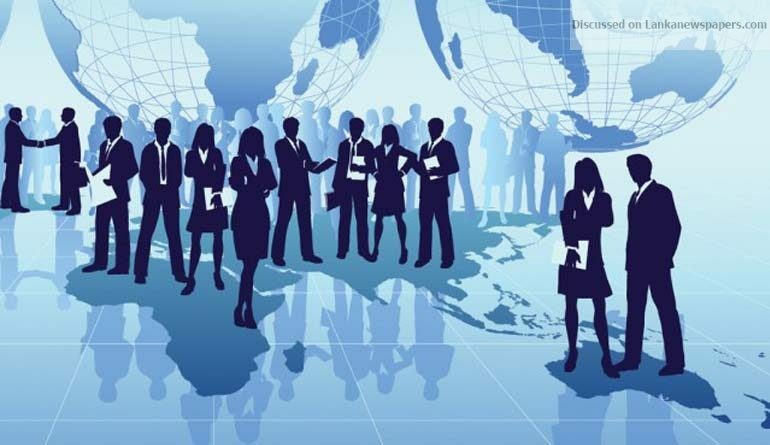 Almost three-quarters (73%) of high-level executives interviewed for the inaugural edition of the Business Barometer: Sri Lanka CEO Survey carried out by Oxford Business Group (OBG) were bullish about local market conditions for 2018, in a sign that the impact of last year’s challenging weather conditions on the economy is easing. As part of its survey, the global research and consultancy firm asked dozens of C-suite executives from across the country’s industries a wide-ranging series of questions on a face-to-face basis aimed at gauging business sentiment in recent months. The results of the survey are now available to view in full on OBG’s Editors’ Blog at: https://oxfordbusinessgroup.com/blog/patrick-cooke/obg-business-barometer/ceos-tip-textiles-lead-sri-lankas-export-revival-2018. 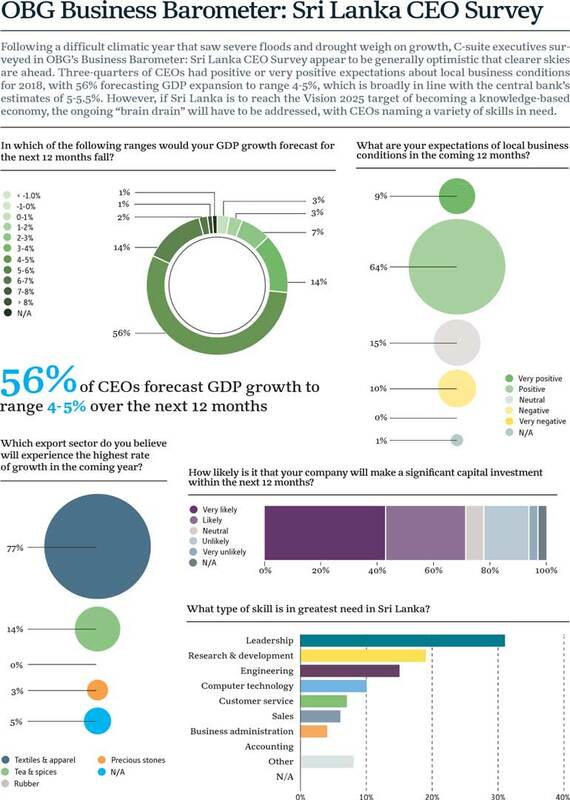 In response to a question about business prospects, 64% of executives described their expectations for the coming 12 months as positive, with an additional 9% saying their outlook was very positive. Three-quarters of respondents also said they expected the company they represented to make a significant capital investment in the coming months, in another indication of rising business confidence. On the subject of the broader economic outlook, more than half (56%) said they believed GDP growth would reach between 4% and 5% in 2018, close to the forecasts made by the central bank of around 5%-5.5%. With the Government’s efforts to reach a targeted $ 20 b in export earnings by 2020 gathering pace, business leaders were largely in agreement on which segments they felt would drive international sales. The majority (77%) told OBG that they expected textiles and apparel to drive export growth, well ahead of second-placed tea and spices (14%). When asked which external event they felt was most likely to affect the local economy in the short to medium term, almost half (49%) of those surveyed cited a rise in oil prices, while, perhaps surprisingly, just 16% opted for a slowdown in demand from China. With labour shortages a major issue in Sri Lanka, OBG also asked business leaders which skills were most in-demand in the workplace. Close to one-third (31%) chose leadership attributes, with 19% opting for research and development. Commenting on the results in his blog, Patrick Cooke, OBG’s Regional Editor for Asia, said business leaders appeared to be broadly positive about Sri Lanka’s prospects following the severe floods and drought that curbed economic expansion in 2017, with many seemingly prepared to “put their money where their mouth is”. Cooke added that Sri Lanka enjoyed several advantages, including its prime location between the Middle East and Asia, while its reacquisition of Generalised Scheme of Preferences Plus status, which removes the bulk of import duties on goods entering the European single market, would bring added benefits. He noted, however, that Sri Lanka also faced a number of challenges, which ranged from immediate issues, such as risks to growth from political uncertainty sparked by recent local election results, to ongoing high debt repayments and a long-running brain drain. “Sri Lanka will need to overcome notable shortages in the labour market if it is to achieve its Vision 2025 target of developing into a highly competitive knowledge-based economy, while still honouring debt commitments,” he said. Cooke’s in-depth evaluation of the survey’s results can be found on OBG’s Editors’ Blog, titled ‘Next Frontier’. All four of OBG’s regional managing editors use the platform to share their expert analysis of the latest developments taking place across the sectors of the 30+ high-growth markets covered by the company’s research. The OBG Business Barometer: CEO Surveys features in the Group’s extensive portfolio of research tools. The full results of the survey on Sri Lanka will be made available online and in print. Similar studies are also under way in the other markets in which OBG operates. This survey has been designed to assess business sentiment amongst business leaders (Chief Executives or equivalent) and their outlook for the next 12 months. Unlike many surveys, the OBG Business Barometer is conducted by OBG staff on a face-to-face basis, across the full range of industries, company sizes and functional specialties. The results are anonymous. Oxford Business Group is a global research and consultancy company with a presence in over 30 countries, from Asia, Africa and the Middle East to The Americas. A distinctive and respected provider of on-the-ground intelligence on many of the world’s fastest growing markets, OBG has offices in London, Berlin, Dubai and Istanbul, and a network of local bureaus across the countries in which we operate.